Ramanagara District: Now an A.T.M and a post office branch in Ghousia Engineering College campus. Now an A.T.M and a post office branch in Ghousia Engineering College campus. Ghousia Engineering College in Ramanagara is known for its excellence in academics and facilities provided to students. Its sprawling campus with importance to greenery is awesome. The college campus now has an A.T.M. counter and a post office branch. 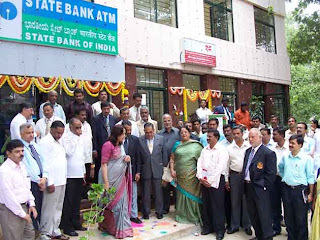 State Bank of India has commenced its A.T.M. counter and the Post Office its branch. Today Principal Chief Post Master General of Karnataka Circle inaugurated the Post Office Branch, while Chief General Manager of State Bank of India inaugurated the A.T.M. counter. College Principal Dr. Mohamed Haneef, Founder of Al-Ameen Movement Dr. Mumtaz Ahmed Khan, President of Ghousia Industrial & Engineering Trust Mr. Zahedulla Meccai and many other dignitaries were present on the occasion. Apart from these activities the 1st Semester B.E. classes were also formally inaugurated today. Government Engineering College in Ramanagara soon! Ramanagara being the Karnataka Chief Ministers constituency is receiving utmost importance regarding development. Crores of Rupees is being spent for the development of Ramanagara. The Chief Minister has decided to make it a model District Head Quarters. Very soon Ramanagara will get a Government Engineering College!